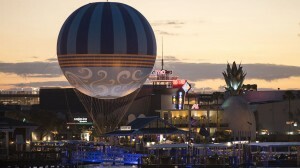 Characters in Flight, the anchored balloon at Disney Springs, has been updated. Gone are the characters that graced the old balloon and in their place is a design that “complements the recently transformed property” of Disney Springs. The new design was reportedly inspired by the springs at Disney Springs and the element of water. The colors of the balloon are shades of blue with a scrolling pattern. Characters in Flight takes guests 400 feet up in the sky while remaining anchored to the ground. The price is $20 per person for guests ages 9 and older, and $15 for guests ages 3-8. Tickets for rides before 10 a.m. are only $10 a person, regardless of age. The balloon opens each day at 8:30 a.m., weather permitting.